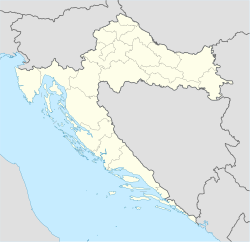 Varaždin (Croatian pronunciation: [v̞âraʒdiːn] Hungarian: Varasd, German: Warasdin) is a ceety in North Croatie, 81 km (50 mi) north o Zagreb on the heichway A4. The tot population is 47,055, wi 38,746 on 34.22 km2 (13.21 sq mi) o the ceety settlement itself (2011). The centre o Varaždin coonty is located near the Drava river, at 46°18′43″N 16°21′40″E﻿ / ﻿46.312°N 16.361°E﻿ / 46.312; 16.361. It's mainly kent for its baroque biggins, textile, fuid an IT industry. This page wis last eeditit on 11 Mairch 2018, at 07:51.